MANY PEOPLE HAVE A LOT OF PROBLEM ARRANGING A KIDS BATHROOM. VERY OFTEN QUESTION POP UP LIKE: SHOULD I CHOOSE COLORFUL TILES? TILES WITH PATTERNS? SHOUD I STAY WITH CLASSIC TILES THAT WILL BE IN FASHION ALSO WHEN KIDS GROW UP? HOW TO STYLE A KIDS BATHROOM AND FOR WHICH ELEMENTS IN THE FUNCTIONAL LAYOUT WE SHOULD PUT MAXIMUM ATTENTION? FIRST OF ALL YOU HAVE TO REALIZE THAT TIME PASSES QUICKLY AND OUR NEWBORNS BECOME TEENAGERS AND WHAT FOLLOWS - THEIR TASTE CHANGES. AS A CONSEQUENCE IT IS THE BEST TO KEEP THE BATHROOM THE MOST UNIVERSAL, THE CHARACTER SHOULD BE ADDED VIA ADDITIONS SUCH AS WALL PICTURES, AN INTERESTING MIRROR, FLOOR CARPETS, TOWELS OR SOAP DISHES. THEY CAN BE EASILY EXCHANGED FOR OTHERS AND THANKS TO THAT YOUR BATHROOM WILL GAIN NEW FRESHNESS. WHAT IS MORE IMPORTANT THERE WILL BE NO NEED TO MAKE A TOTAL AND COSTLY REFURBISHMENT. AS IT COMES TO THE COLORS OF THE TILES OR WALLS, IT IS THE BEST TO CHOOSE NATURAL TINGES, WHICH WILL BE ALWAYS NICE AND WILL NOT LOOSE THEIR CHARM AFTER MANY YEARS. WE ALSO RECOMMEND (IF THE SURFACE IS AVAILABLE) TO INSTAL BOTH BATHTUB AND A SHOWER IN THE KIDS BATHROOM. THAT IS A VERY PRACTICAL SOLUTION, AS A CHILD CAN WASH ALONE IN THE BATHTUB, WHILE MOTHER CA NHAVE A MOMENT FOR HERSELF UNDER THE SHOWER AND STILL KEEP ONE EYE ON HER KID. IN THIS WAY SHE CAN SAVE PRECIOUS TIME. 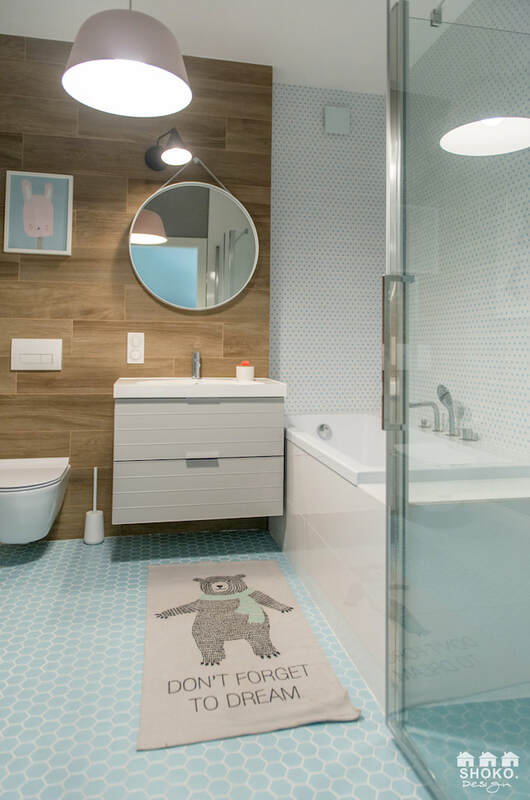 WE DO NOT HOWEVER FIRMLY SAY "NO" TO BATHROOMS WITH TILES IN FUNNY KIDS PATTERNS. 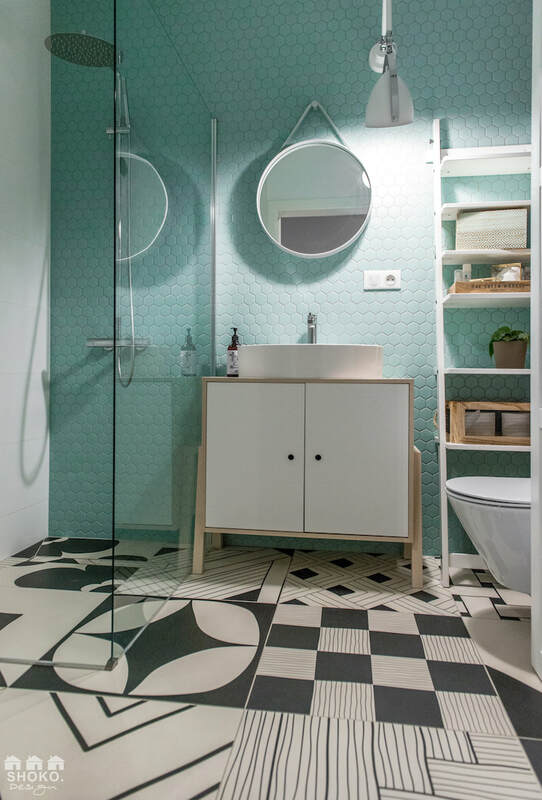 IN OUR OPINION IF YOU WANT TO USE TILES JUST FOR KIDS, THEN CHOOSE GEOMETRICAL PATTERNS AND PASTEL COLORS. AN EXAMPLE OF SUCH A BATHROOM IS PRESENTED BELOW. 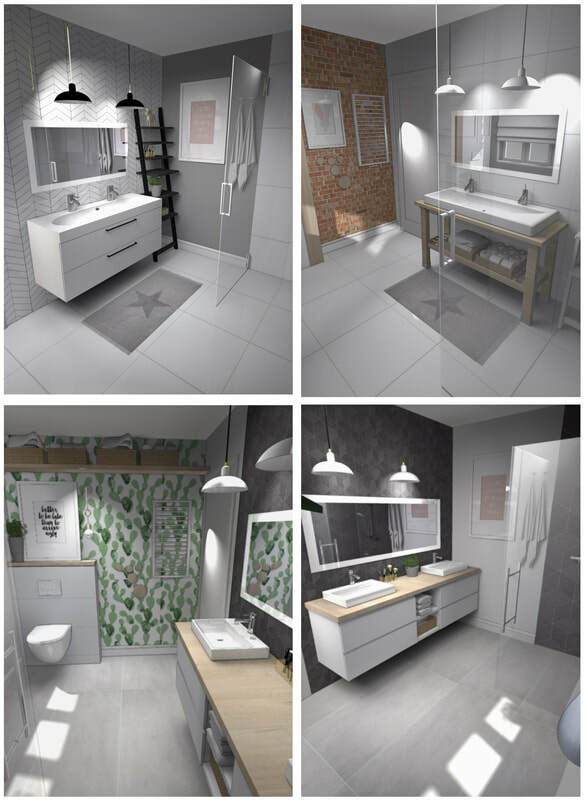 THIS IS OUR BATHROOM FORM THE "MODERN BOHO" PROJECT FOR NELL AND MARIANNA. 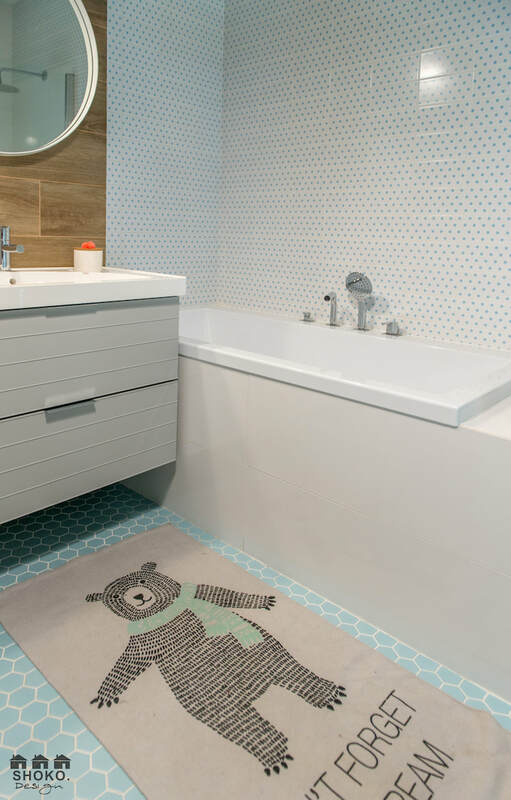 WE HAVE CHOSEN BRIGHT TILES IN BLUE DOTS AND ON THE FLOOR HEXAGONS IN A SIMILAR SHADE. 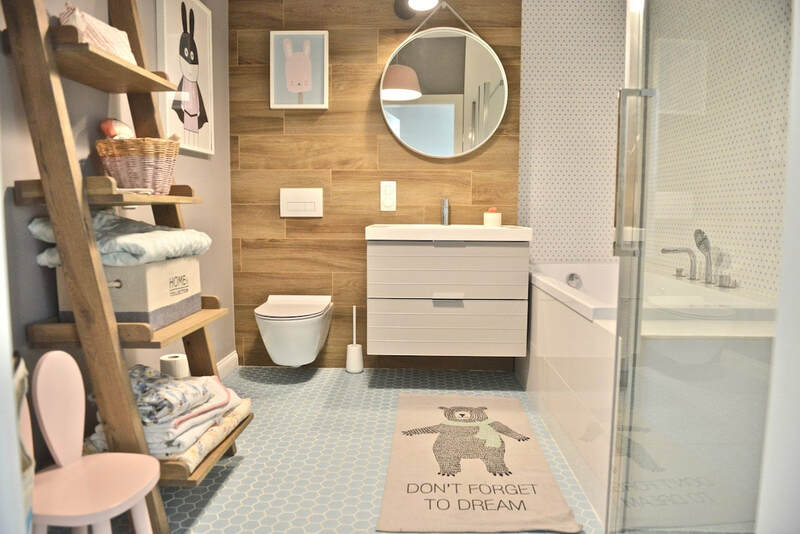 IN OUR OPINION WHEN THE GIRLS GET OLDER AND THEIR TASTE WILL CHANGE, IT WILL BE VERY EASY TO CHANGE THIS KIDS BATHROOM INTO A TEENAGER ONE, BY REMOVING THE POSTERS AND BATHROOM CARPETS AND USING AS AN EXAMPLE A SEA GRASS CARPET AND POSTERS WITH FAVORITE FLOWERS. YOU SHOULD AVOID TILES WITH CHILDREN PRINTS LIKE LITTLE ELEPHANTS, SUNS OR OTHER FUNNY MOTIVES. SUCH A BATHROOM CANNOT BE EASILY CHANGED AND UNFORTUNATELY YOUR KIDS WILL NOT BE SATISFIED WHEN THEY GROW UP AND WOULD BE OBLIGED TO STILL USE THAT BATHROOM. AT THE END YOU CAN SEE FOUR OF OUR VISUALS OF OUR NEW BATHROOM FOR KIDS, THAT IS BEING CREATED AT THIS MOMENT. SOON YOU WILL SEE A FINISHED BATHROOM FOR LILLY AND ELLA!